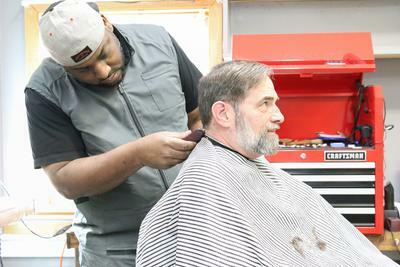 Darryl “Deko” Stewart gives a cut and shave to George Bernier at his shop in Orland. The two were coworkers together at the Verso Paper Mill before it was shut down. When the Verso Paper Mill in Bucksport closed down five years ago, Darryl “Deko” Stewart found himself without a full-time job, and a need to quickly find a source of income to support his family. Drawing on the inspiration of years spent in his uncle’s barber shops in New York City, he decided to follow his real passion and attend school to become a certified barber. Stewart attended school in Augusta to get his certification, and has been busy making a name for himself ever since. He operates Deko’s Kutz at the Community Center in Orland and is in Castine at Lethabo Massage Studio and Day Spa on Tuesdays each week. Stewart connects to the Castine community through Maine Maritime Academy students, many of whom have chosen him as their barber. “These kids are from all over the country, it’s really cool that they trust me to be that person who can remind them of where they get their hair cut back at home. It reminds them a little of home, which is great,” he said. In Maine, a barber can only become a Master Barber after an apprenticeship under a cosmetologist. Stewart is doing that with his time at Lethabo, a commitment he said is worth the 2,500 hours of time he needs to complete the license. Stewart is inspired by the barber shops of old, when guys would walk in off the street, gather in the barber shop and tell stories, jokes, rumors, and use the shop as their own little community. Stewart takes walk-ins only, which allows people to get a feel of what he does. From the initial “what are we doing today?” question to the back rub at the end of the cut, Stewart says he enjoys that people can come in and see something happen from start to finish. Stewart’s passion keeps him running through the six days a week he is open, and he said he is grateful that he has been able to have a successful shop in a small area. Stewart is open Monday and Wednesday through Saturday in Orland and is in Castine all day on Tuesday.